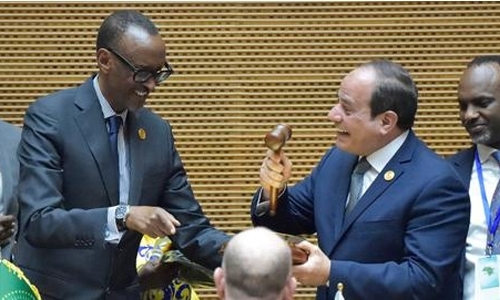 Rwandan President Paul Kagame, who led an active, reformist tenure as African Union chair, yesterday passed the baton to Egypt, seen as more likely to focus on security issues than expanding the body’s powers. Egyptian President Abdel Fattah al-Sisi officially took over the rotating post of ceremonial head of the AU at the start of a two-day summit in Addis Ababa. The meeting highlighted the “links between the Mediterranean and Lake Victoria,” as a metaphor for sub-Saharan Africa. “The road is still long” in terms of reaching the AU’s goal of “silencing the guns” by 2020, Sisi told delegates on Sunday. He announced he would hold a “forum for peace and development” in the town of Aswan, southern Egypt, in 2019. United Nations Secre - tary-General Antonio Guterres said Saturday that peaceful elections in DR Congo, Mali and Madagascar, peace deals in South Sudan and Central African Republic and the truce between Ethiopia and Eritrea, were however signs of a “wind of hope” on the continent. Guterres also hailed the solidarity shown in Africa, where countries house nearly a third of refugees and displaced people in the world. “Despite the continent’s own social, economic and security challenges, Africa’s governments and people have kept borders, doors and hearts open to millions in need,” he said. “Unfortunately, this example has not been followed everywhere.” The chairmanship of the AU rotates between the five regions of the continent, and South Africa will take over from Egypt next year. While multiple crises on the continent will be on the agenda of heads of state from the 55 member nations, the summit will also focus on institutional reforms, and the establishment of a continent-wide free trade zone. While the Continental Free Trade Area (CFTA) was agreed by 44 nations in March 2018, only 19 countries have so far ratified the agreement. It requires 22 to ratify it for it to come into effect. The single market is a flagship of the AU’s “Agenda 2063” programme, conceived as key to transforming the continent’s economies. Cairo is backing the initiative, but analysts say it will be less likely to focus on the financial and administrative reforms pushed by Kagame. Kagame, who has been leading institutional reforms since 2016, pushed for a continent-wide import tax to fund the AU and reduce its dependence on external donors, who still pay for more than half the institution’s annual budget. But member states have resisted both this and moves to strengthen the powers of the AU Commission, its executive organ. In November 2018, most states rejected a proposal to give the head of the AU Commission the power to name deputies and commissioners. Kagame suffered a setback after expressing “serious doubts” on behalf of the AU about the results of the Democratic Republic of Congo’s recent presidential election, which was officially won by Felix Tshisekedi. The country’s Catholic church had also questioned the result. But the DRC’s constitutional court validated the results anyway and continental heavyweights South Africa, Kenya and Egypt acknowledged Tshisekedi’s victory. “This whole thing was an embarrassment for the AU, it showed the limitations of what the AU chairperson can do,” said Jobson.